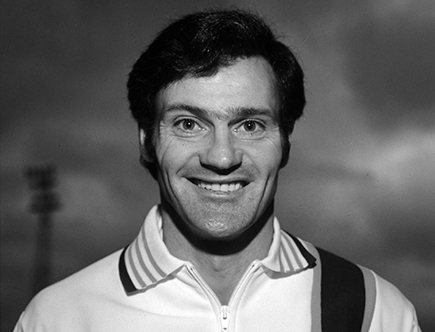 Motherwell FC is today saddened to learn of the passing of former manager Roger Hynd, aged 75. Roger, the nephew of Liverpool legend Bill Shankly, had a fine playing career, most notably for Rangers with whom he had played in a European Final, and Birmingham City in the English top flight. He arrived at Fir Park in 1977 following a spell in which John Hagart had acted as caretaker following Willie McLean’s departure. The traditional new manager “bounce” was certainly visible. His first seven games in charge saw five wins against Partick Thistle, Celtic, St. Mirren, Ayr United and Arboath, with two draws, against Dundee United and Aberdeen, with the loss of a solitary goal at Tannadice. This form had brought a new found belief to Fir Park as the Champions elect Rangers came to North Lanarkshire in February 1978. The atmosphere generated by the 20,000 crowd had the old stadium crackling with anticipation as the Steelmen and Light Blues took to the field. Within minutes the ‘Well fans were in dreamland as the hosts raced into a two goal lead through strikes from Jimmy O’Rourke and Vic Davidson. As the teams settled to restart the game, there appeared to be an “exchange” between Home defender, Willie McVie and a section of Rangers fans. Within seconds, thousands of visiting fans invaded were on the pitch, leaving the referee with no option but to take the players back to the sanctuary of the dressing rooms. Around half an hour had passed before order was restored, allowing Rangers to finally kick off again. The break had allowed the then Rangers boss, Jock Wallace, to settle and rearrange things from Motherwell’s whirlwind start, and the visitors clicked into gear, eventually running out 5-3 winners in a truly titanic struggle. The final four league games of 1977/78 season saw four defeats, all without troubling the opposing goalkeeper. And whilst everybody else in the country was settling down that summer to watch Scotland having a crack at winning the World Cup in Argentina, Roger was hatching a plan to make the his first full season in charge at Fir Park an improvement on the sixth place finish the club had just earned. And he appeared to have bought shrewdly that close season with ‘keeper, Dave Latchford, defender Alan Mackin and strikers John Clifford and Mike Larnach all arriving from Birmingham City, Queen’s Park, Celtic and Newcastle United respectively. The first game of the new campaign would see West Bromwich Albion at Fir Park for Joe Wark’s Testimonial, only the second such game sanctioned by the club after Charlie Aitken’s, twenty-one years earlier. It’s fair to say Motherwell with, Roger’s new recruits involved, couldn’t cope with winger Laurie Cunningham, who’d go on to star for Real Madrid, as the English aces romped to an 8-1 win. The start to the season wasn’t favourable though and after just a few months, Hynd had handed in his resignation. That ended his association with professional football and he spent a significant part of his career away from the game in teaching. Although history won’t necessarily recall Hynd’s time in North Lanarkshire as a roaring success, his 14 wins, 19 defeats and only 3 draws, is not a record to be ashamed of whatsoever. Everyone at Motherwell FC would like to express our sincere condolences to Roger’s wife Jane, along with the entire Hynd family at this very sad time. Extended highlights from Celtic Park where despite a spirited performance Motherwell lose 2-0 to Celtic. Images from today’s 2-0 loss to Celtic in the Ladbrokes Premiership at Celtic Park. Despite defeat, ‘Well boss Mark McGhee believes that confidence has been restored among the squad following his sides spirited performance against Celtic this afternoon. Given Celtic’s recent form and on the back of Wednesday night’s defeat away to Aberdeen, the Steelmen’s showing this afternoon lifted the Fir Park gaffer’s spirits. Speaking to MFC TV at full time, McGhee said: “I think we can come out of here today with some sort of confidence, belief or positivity. He added: “We really raised our game and we’re pleased with that and I think we can look forward now to the next run of games with some sort of optimism. “We’ve got Scotty back and I think he was excellent today, Craig Clay was fantastic, Moulty worked hard and the boys who came in like Jack McMillan and Joe Chalmers. You can watch the manager’s full post match interview exclusively at MFC TV’s YouTube channel. Despite an spirited performance, Motherwell lost 2-0 away to Celtic in the Ladbrokes Premiership this afternoon. And while it was a stark contrast from Wednesday night’s bitterly disappointing performance, in the end, runway league-leaders Celtic were just too strong for the Steelmen. Mark McGhee named three changes to the side which lost in midweek, with Scott McDonald returning from suspension and taking Elliott Frear’s place, Jack McMillan replacing the suspended Richard Tait and Craig Clay coming in for Lee Lucas. However, the manager was forced in to further changes when Stevie Hammell pulled up in the pre-match warm-up, Joe Chalmers stepped in. There was yet more chopping and changing required as Stephen McManus was forced off through injury after five minutes, Zak Jules was introduced to the action as the veteran defender limped off. There were no chances in the opening 20 minutes, as Celtic were content to keep the ball and bed themselves in to the game, while Motherwell defended well and limited the home side to one real opportunity which came in the 25th minute. Some intricate passing and neat movement from Celtic’s front four nearly led to the breakthrough, but James Forrest’s shot was palmed away by Samson, only as far as Henderson, who turned his effort wide of the mark. Brendan Rodgers side eventually found the breakthrough though, when Moussa Dembele stroked a penalty past Samson following Zak Jules’ foul in the box. The Steelmen responded well and had two terrific chances in quick succession, a deep cross in to the box from Chalmers found Louis Moult at the back post but the forward headed narrowly wide from close range. Two minutes later, it looked like Pearson had levelled the score. The ball broke to the midfielder 12 yards out but his low effort was saved by Craig Gordon low to his right. However, the positive response from Motherwell was cut short when Celtic doubled their lead five minutes before the break. Forrest picked the ball up on the right flank, twisted and turned and fired a low shot past Samson despite all of Motherwell’s positive play. The Fir Parkers regrouped and got off to a positive start in the second half, and some good passing play down the left flank led to a decent opportunity for McDonald, but the Aussie scuffed his shot a little and was denied by the offside flag anyway. McGhee made his second change of the afternoon when he decided to replace Chris Cadden with Ryan Bowman, shifting the shape of the team to accommodate the three forwards and push for a way back in to the game. Much like the first half, neither side created too much in the first 20 minutes and Celtic, looking most threatening through Scott Sinclair down the left flank, skewered a few good opportunities off target. The Steelmen started to peg Celtic back for a good spell and put increasing pressure on Nir Bitton, who’s slack passes afforded the visiting Fir Parkers a couple of half chances to create opportunities deep in Celtic’s half. A surging run forward from Zak Jules saw the defender nearly burst in to the box, but a last ditch tackle by Simunovic denied the young defender at the expense of a corner. From the set piece, Gordon came off his line well to pluck it out the air. McGhee’s men looked increasingly impressive in the final ten minutes, and a golden opportunity fell to Stephen Pearson following a set piece. The ex-Celtic man fired over from six yards but it was a tough one for the midfielder. Zak Jules took the opportunity to maraud forward again and looked comfortable on the ball, but Celtic, who had taken their foot off the gas, were too deep and crowded out the ‘Well attack. Celtic held on to their clean sheet and despite a late surge and impressive end to the match, Motherwell couldn’t find what would have been a deserved goal. Celtic sub, McGregor on for Bitton. Another decent chance! Bowman flicks on a corner into the path of Pearson but he can’t get a good connection on it. Over the bar. Close! McDonald very nearly catches out Gordon at the front post with a sneaky cross/shot. Sinclair should have made it three but with all the goal to aim for, blazes it well over the bar. Good football again from Motherwell but this time Clay’s effort from 25 yards sails well over the bar. Free-kick to Celtic right on the edge of the box….Sinclair curls it over the bar. ‘Well have the ball in a good area but Celtic steal it and break. Thankfully Dembele fires just wide of the post. Good start to the half from the Steelmen. Ball is knocked around well and slid into McDonald but he can’t test Gordon. Half-time change for Celtic, Armstrong on for Henderson. Clay gets forward and into a good area but his cross/shot is plucked out the air by Gordon. Goal – despite a good spell, Forrest breaks down the right, twists and turns and fires low past Samson. What a chance! Ball breaks to Pearson 12 yards out but Gordon is equal to his low shot, palming it away to safety. Close!! Chalmers whips in a deep ball which Moult heads inches over the bar! Goal – Dembele steps up and sends Samson the wrong way. Moult tracks back but has to concede a corner….penalty to Celtic! Very few chances so far. Sinclair has a half-chance but scuffs it wide from a difficult angle. Corner Motherwell…..played short but Celtic defend it well. First chance of the game falls Celtic’s way. Forrest’s shot is beaten away then Henderson can’t convert from the rebound. Good little spell of passing there but McDonald is caught offside when on the end of a killer pass from Clay. Motherwell sub, McManus is forced off with that knock, so will be replaced by Jules. Unfortunately we’re having some technical issues with mixlr so there will be no commentary this afternoon. Lasley gets the game underway. COYW!!! Motherwell hosted Celtic back in December in the third meeting between the two sides this season in what was a dramatic clash. And despite taking a two goal lead in to the break, the Steelmen suffered an agonising 3-4 loss at Fir Park. A wonder goal from Louis Moult in the third minute got the Steelmen off to a dream start and ended Celtic’s 10-hour period without conceding in the league – before the forward added a second to go in to the break with a two goal cushion. That was followed by a frantic second half, and a more frantic three minute spell, in which Celtic clawed back in to the game and eventually scored a last minute winner. Mark McGhee named two changes to the side that lost 3-0 away to Hearts prior to the match, with Stevie Hammell returning to the starting eleven in place of Jack McMillan and Ross MacLean in for David Ferguson, as the manager switched to a back four. Celtic, fresh off their League Cup triumph over Aberdeen, named just one change – with veteran Kolo Toure stepping in for the in-form Erik Sviatchenko. It was a dream start for the ‘Well when Louis Moult opened the scoring after just three minutes – and what a goal it was. An inch perfect ball over the top by McManus was anticipated superbly by Moult, who sprung the offside trap and with the inside of his right boot, lifted the ball over the helpless Gordon. The Steelmen went close to a second in the 16th minute and again the move started off from the left boot of Stephen McManus. The centre-back swept a fantastic ball out wide to Tait, who cushioned it neatly back inside towards Moult who pulled off an outstanding back-heel pass to Cadden to get in behind the Celtic defence. The midfielder pulled it back but Simunovic intercepted to clear the danger. Celtic enjoyed long spells of possession in the opening 20 minutes, but failed to create any clear cut chances and ‘Well stopper Craig Samson was untested. Cadden was proving to be too much to handle for full-back Izaguirre and in the 25th minute won a free kick in a dangerous area after the defender hacked him down. From the set piece, Stevie Hammell whipped in a wonderful ball which Heneghan headed low on target, but Gordon gathered comfortably. Two minutes later and the Fir Parkers were inches from a second and it was Moult looking dangerous again. Cadden enjoyed plenty of space to storm into down the right and fired a great ball low across the box. Moult got a touch on it with his right foot but it wasn’t quite enough and it flew narrowly past Gordon’s far post. Celtic were limited to efforts from outside the box and Armstrong went closest with a good strike from range, but Samson confidently saw it wide. Izaguirre was substituted after 29 minutes as manager Brendan Rodgers took no risks, swiftly withdrawing the defender after he found himself in the book early doors – he was replaced by Callum McGregor. In the 35th minute, Fir Park erupted as Moult got his second and doubled his side’s lead. Youngster MacLean sent another inch perfect cross towards the back post, eliminating Celtic’s entire defence from the play and allowing Moult to stride in and send another volley past Gordon, this time beating the stopper at his near post. Some neat footwork by Dembele on the stroke of half time created a half chance for the forward, but he blazed his strike high and wide. Three minutes after the break, Celtic pulled one back through McGregor who played a neat one-two in to the box, finishing low past Samson. The goal spurred the visitors in to life and Motherwell were on the back foot for much of the opening ten minutes of the second half. Rogic, growing ever more influential in the middle of the park, tested Samson from close range but the ‘keeper did well to make himself big and block the goal bound effort. Two minutes later James Forrest burst past Stevie Hammell to create the space he needed to fizz a low cross in front of goal, but it flew by untouched and eventually trickled out for a ‘Well throw. Samson produced a fine save to deny Rogic again in the 65th minute, getting across well to palm away to safety and deny the ball from curling in to the top corner. The tireless Chris Cadden was forced to leave the field when he went down injured, he was replaced by Lionel Ainsworth with 22 minutes remaining. But almost instantly after the change, Celtic drew level when Patrick Roberts latched on to a good cross at the back post and head into the ground past Samson, and the equaliser was the first of an outrageous three minute goal spree. Immediately down the other end from kick-off, Stevie Hammell sent in a delightful cross to the back post where Ainsworth was waiting to volley past Gordon. Celtic responded in the same manner, this time Stuart Armstrong, who latched on to a neat through ball from Roberts, was gifted too much space in the box and the Scottish midfielder passed it low past Samson to level the scoring. Mark McGhee made his second change of the afternoon at that point, bringing off Ross MacLean for Jack McMillan. Richard Tait did well to win a corner for the Fir Parkers in the 84th minute, and from the following delivery McManus got his head on it and turned it towards goal, but it was a little too central and Gordon held it. In heart breaking fashion, Celtic snatched the lead right at the moment the fourth official indicated the additional time to be added. Tom Rogic shifted the ball on to his right foot and fired low past Samson into the far corner. The table toppers held on for the final minutes to secure the three points, but it was a spirited Motherwell performance at Fir Park and a sickening blow for the Steelmen to concede so late. Motherwell make the short trip to Glasgow tomorrow to take on league leaders Celtic in the Ladbrokes Premiership. And after Wednesday night’s heavy defeat to Aberdeen, the Steelmen will be hungry to get back to action quickly, but face a tough test. Under Brendan Rodgers, Celtic have gone undefeated in the league and have only dropped points in an away game against Inverness CT back in September. But for ‘Well assistant manager James McFadden, that adds incentive for the Steelmen to not only bounce back, but also put an end to the Hoops winning run. The Fir Park number two said: “We’ve done well against Celtic this season, albeit we’ve lost but especially the last home game we felt we did well, we came up with a game plan that almost worked. In terms of league fixtures, Celtic head in to Saturday’s 3pm kick off on the back of a 5-2 victory over St Johnstone. On the face of things, it was a dominant result for the Champions, but in truth, Rodgers men had to work hard after going in to the break 2-1 behind. Motherwell face a mental battle to bounce back from what was undoubtedly the worst result of the season, yet after 24 games, the Fir Parkers are only one point behind sixth placed Kilmarnock and will arrive at Parkhead full of desire. Mark McGhee will be without the suspended duo of Carl McHugh and Richard Tait, while Celtic will have Leigh Griffiths and Tom Rogic out through injury. He scored a brace when Celtic arrived at Fir Park back at the start of December and is the last player to score a winning goal at Parkhead in the league, so Louis Moult is undoubtedly one to watch tomorrow. And ahead of the match at Parkhead, the forward insisted that the Fir Parkers must have belief. The 24-year-old believes it is key to preparations following Wednesday nights “horrible” defeat away to Aberdeen. He said: “It’s obviously going to be difficult but we’ve got to go there with belief and believe we can cause an upset. It’s obviously going to be difficult but we’ve got to go there with belief and believe we can cause an upset. He added: “To get beat 7-2 is horrible. I didn’t get much sleep that night and I’m sure the lads didn’t either. Moult scored one of the contenders for goal of the season when he lobbed Craig Gordon inside three minutes and the forward admitted that previous performances against the runaway league leaders can give the Steelmen confidence. He said: “That goal is definitely one of my favourites that I’ve scored but things obviously didn’t turn out how we would’ve liked. The prospect of facing Celtic in their current form is a daunting one for every side in the league as they remain unbeaten under Brendan Rodgers. And tomorrow presents the Hoops with a chance to rack up their 20th straight victory in the Premiership. Summer signings Scott Sinclair and Moussa Dembele are obvious threats for tomorrow’s hosts, with the two contributing directly to 54 goals in all competitions this season. However, one of the main strengths Celtic have is depth, with the likes of James Forrest, Stuart Armstrong, Gary Mackay-Steven, Tom Rogic, Patrick Roberts, Kris Commons and Callum McGregor competing for spots in midfield. The absence of Tom Rogic could have been a big loss for the Champions, but with other stars like Liam Henderson coming in to form, the depth at Rodgers disposal is evident. Goals haven’t been an issue for the Glaswegians, and when both Dembele and Sinclair were out of action recently, important goals came from other areas of the pitch. Dedryck Boyata popped up with two crucial winning goals against both Aberdeen and St Johnstone and is one of the numerous examples of players rediscovering or even finding their best form under their Northern Irish manager. Currently 24 points clear of second placed Aberdeen, Celtic could potentially wrap up the title by mid March. But Brendan Rodgers and his team will be well aware that the last team to beat them at Parkhead was Mark McGhee’s Motherwell last season. Ahead of tomorrow’s clash, both sides will be full of desire for different reasons, but it makes for an interesting encounter. Stephen Craigan’s youngsters will face Celtic under 20s in the semi final of the Scottish FA Youth Cup. Following their 1-0 victory over Hibernian in the quarter final today, the Glasgow based side will be the next challenge for the young Steelmen who are looking to defend the trophy they lifted last season. For Motherwell, it means another clash with the Hoops following their recent 3-2 loss in the Development League. So far, Motherwell have had to overcome Cumbernauld Colts, Greenock Morton and Partick Thistle to reach the final four in the competition. Further details, including fixture date, will be confirmed soon. ‘Well assistant James McFadden believes that the Steelmen are ready to go and fight against Celtic tomorrow. After suffering a painful defeat on Wednesday night, McGhee’s number two revealed the players desire to bounce back to action tomorrow. Speaking to the press this morning, McFadden admitted that the mood was low after Wednesday night, but it was time to look forward. He said: “We were obviously pretty low yesterday, but we stayed up after the game and we had a cool down. He added: “The biggest thing here is that we lost the game, we were nowhere near it and we never turned up in terms of making it easy for Aberdeen. With Celtic up next, the assistant manager revealed the teams desire to put an end to the fantastic run they are currently on. He said: “We’ve done well against Celtic this season, albeit we’ve lost but especially the last home game we felt we did well, we came up with a game plan that almost worked. Striker Louis Moult insists Motherwell must have belief as they head in to tomorrow’s league clash with Celtic at Parkhead. Speaking to the press this morning, Moult was keen to look ahead and put the midweek loss out of his mind. To watch Louis’s full interview and for more exclusive content, subscribe to MFC TV’s YouTube channel.